Dadashi, S., Mousazadeh, M., Emam-Djomeh, Z., Mousavi, S. (2013). Pomegranate (Punica granatum L.) seed: A comparative study on biochemical composition and oil physicochemical characteristics. International Journal of Advanced Biological and Biomedical Research, 1(4), 351-363. Saeed Dadashi; Morad Mousazadeh; Zahra Emam-Djomeh; Seyed Mohammad Mousavi. "Pomegranate (Punica granatum L.) seed: A comparative study on biochemical composition and oil physicochemical characteristics". 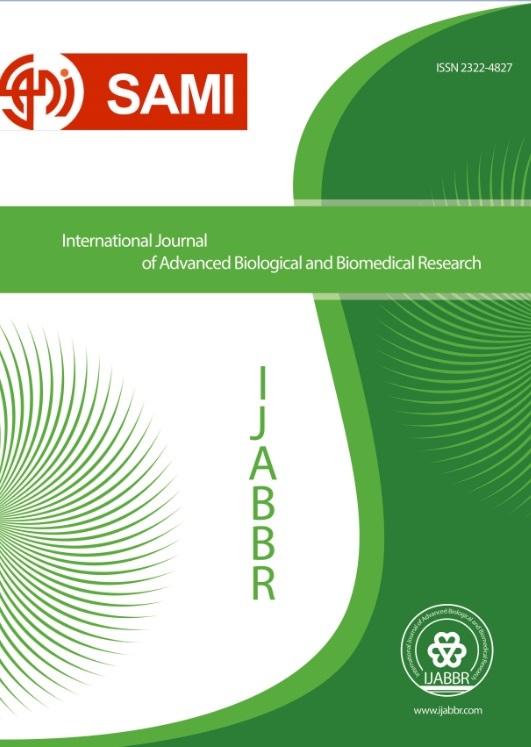 International Journal of Advanced Biological and Biomedical Research, 1, 4, 2013, 351-363. Dadashi, S., Mousazadeh, M., Emam-Djomeh, Z., Mousavi, S. (2013). 'Pomegranate (Punica granatum L.) seed: A comparative study on biochemical composition and oil physicochemical characteristics', International Journal of Advanced Biological and Biomedical Research, 1(4), pp. 351-363. Dadashi, S., Mousazadeh, M., Emam-Djomeh, Z., Mousavi, S. Pomegranate (Punica granatum L.) seed: A comparative study on biochemical composition and oil physicochemical characteristics. International Journal of Advanced Biological and Biomedical Research, 2013; 1(4): 351-363. The pomegranate seeds of four Iranian commercial varieties (Abanmahi (AB), Malas (MS), Pust Sefid (PS) and Shahvar (SH)) were evaluated in terms of some quality properties including protein, oil, dietary fiber, mineral contents and fatty acid composition. Physicochemical properties and antioxidant activity of pomegranate seed oils (PSOs) were also determined. The oil antioxidant activity was measured by 1,1-diphenyl-2-picrylhydrazyl (DPPH) radical scavenging capacity. Results showed that PS had the highest oil (16.9%) and crude fiber (42.4%), and nutritional value (460.7Kcal/100g) among selected varieties. PS had the highest level of phosphorus (2766.3 mg/kg) and magnesium (2052.0mg/kg), while the highest calcium (675.3mg/kg) and potassium (3724.6mg/kg) were related to SH. The main fatty acid identified by gas chromatography was punicic acid ranged from 72.07% for SH to 73.31% for MS (p<0.05). The ratios of polyunsaturated/saturated and unsaturated/saturated fatty acids of PSOs were found to be between 9.174 and 9.450, and 10.325 and 10.861, respectively (p<0.05). PSOs obtained presented acid (3.78-8.36% punicic acid), peroxide (0.39-0.48meq O2/kg), iodine (216.9-220.3g I2/100g) and saponification (179.3-182.5mg KOH/g) values. Also, refractive index at 25°C, viscosity and density of PSOs varied from 1.461-1.527, 0.036-0.063Pa.s and 0.9202-0.9311g/cm3, respectively. The oil obtained from MS showed the lowest level of ortho-diphenols (ODC) and DPPH radical scavenging capability. The relationship between percentage of remaining DPPH and ODC of PSOs also illustrated high correlation among all varieties (R2 = 0.98, p<0.01). AACC. (1987) Method 46-11. Approved methods of the AACC. American Association of Cereal Chemists, Inc., St Pau, Minn.
Abbasi, H., Rezaei, K., Emamdjomeh, Z., Ebrahimzadeh Mousavi, S.M. (2008) Effect of various extraction conditions on the phenolic contents of pomegranate seed oil. European Journal of Lipid Science and Technology, 110: 435-440. Agte, V.V., Gokhale, M.K., Paknikar, K.M., Cheplonkar, S. (1995) Assessment of peral millet versus rice-based diets for bioavailability of four trace metals. Plant Foods Human and Nutrition, 48: 149-158. Al-Maiman, S.A., Ahmad, D. (2002) Change in physical and chemical properties during pomegranate (Punica granatum L.) fruit maturation. Food Chemistry, 76: 437–441. AOAC. (1990) Official methods of analysis of the Association of Official Analytical Chemists., Washington D.C.
AOCS. (1998) Official Methods and Recommended Practices of the American Oil Chemists’ Society, AOCS Press, Champaign, USA. Chapman, D.H., Pratt, P.F. (1961) Methods of analysis of soils, plants and water. University of California, Riverside: Division of Agriculture Science. El-Nemr, S.E., Ismail, I.A., Ragab, M. (1990) Chemical composition of juice and seed of pomegranate fruit. Die Nahrung, 34: 601–606. El-Nemr, S., Ismail, I., Ragab, M. (1992) The chemical composition of the juice and seeds of pomegranate fruits. Journal of Fruits Vegetables and Nuts, 11: 162-164. El-shaarawy, M.I., Nahapetian, A. (1983) Studies on pomegranate seed oil. Fette Seifen Anstrichm, 85: 123–126. Fadavi, A., Barzegar, M., Azizi, M.H., (2005) Bayat, M. Physicochemical Composition of Ten Pomegranate Cultivars (Punica granatum L.) Grown in Iran. Food Science and Technology International, 11(2): 113-119. Fadavi, A., Barzegar, M., Azizi, M.H. (2006) Determination of fatty acids and total lipid content in oilseed of 25 pomegranates varieties grown in Iran. Journal of Food Compostion and Analysis, 19: 676–680. FAO. (2009) Food Agriculture Organization of the United Nations, Project document for a regional standard for Pomegranate, Rome, Italy. Gutfinger, T. (1981) Polyphenols in olive oils. Journal of the American Oil Chemists' Society, 58: 966-968. Hernandez, F., Melgarejo, P., Olias, J.M., Artes, F. (1998) Fatty acid composition and total lipid content of seed oil from three commercial pomegranate cultivars. Symposium on production, processing and marketing of pomegranate in The Mediterranean Region: advances in research and technology. CIHEAM-IAMZ Zaragoza, Spain 15–17 October, pp 205–209. ISO. (1978) Animal and vegetable fats and oils - preparation of methyl esters of fatty acids. Method ISO 5509,. Kodad, O., Socias, I.C.R. (2008) Variability of oil content and of major fatty acid composition in almond (Prunus amygdalus Batsch) and its relationship with kernel quality. Journal of Agricultural and Food Chemistry, 56: 4096–4101. Kyralan, M., Golukcu, M., and Tokgoz, H. (2009) Oil and conjugated linolenic acid contents of seeds from important pomegranate cultivars (Punica granatum L.) grown in Turkey. Journal of the American Oil Chemists' Society, 86: 985–990. Kornsteiner, M., Wagner, K.H., Elmadfa, I. (2006) Tocopherols and total phenolics in 10 different nut types. Food Chemistry, 98: 381–387. Martinez, M.L., Maestri, D.M. (2008) Oil chemical variation in walnut (Juglans regia L.) genotypes grown in Argentina. European Journal of Lipid Science and Technology, 110: 1183–1189. Melgarejo, P., Salazar, D.M., Amoros, A., Artes, F. (1995) Lipid and fatty acid composition of seed oil from six pomegranate cultivars. Journal of the Science of Food and Agriculture, 69: 253–256. Melgarejo, P., Artes, F. (2000) Total lipid content and fatty acid composition of oil seed from lesser known sweet pomegranate clones. Journal of the Science of Food and Agriculture, 80: 1452–1454. Moodley, R., Kindness, A., Jonnalagadda, S.B. (2007) Elemental composition and chemical characteristics of five edible nuts (almond, Brazil, pecan, macadamia and walnut) consumed in Southern Africa. Journal of Environmental Science and Health, Part B, 42: 585–591. Olaniyi, A.A., Ayin, J.S.K., Ogundaini, A.O., Olugbade, T.A. (1993) Essential Inorganic and Organic Pharmaceutical Chemistry. Shaneson C.I. Ltd., Ibadan, Nigeria. Ozcan, M.M. (2009) Some Nutritional Characteristics of Fruit and Oil of Walnut (Juglans regia L.) Growing in Turkey. Iranian Journal of Chemistry & Chemical Engineering, 28: No. 1. Parcerisa, J., Rafecas, M., Castellote, A., Codony, R., Farran, A., Garcia, J., Gonzalez, C., Lopez, A., Romero, A., Boatella, J. (1995) Influence of variety and geographical origin on the lipid fraction of hazelnut (Corylus avellana L.) from Spain: (III) oli stability, tocopherol content and some mineral contents (Mn, Fe, Cu). Food Chemistry, 53: 71-74. Sassano, G., Sanderson, P., Franx, J., Groot, P., Straalen, V.J., Bassaganya-Rierac, J. (2009) Analysis of pomegranate seed oil for the presence of jacaric acid. Journal of the Science of Food and Agriculture, 89: 1046-1052. Schubert, S.Y., Lansky, E.P., Neman, I. (1999) Antioxidant and eicosanoid enzyme inhibition properties of pomegranate seed oil and fermented juice flavonoids. Journal of Ethnopharmacology, 66: 11–17. Shantha, N.C., Decker, E.A. (1994) Rapid, sensitive, iron-based spectrophotometric methods for determination of peroxide values of food lipids. Journal of AOAC International, 77(2): 421–424. Yamasaki, M., Kitagawa, T., Koyanagi, N., Chujo, H., Maeda, H., Kohno- Murase, J., Imamura, H., Tachibana, K., Yamada, R. (2005) Dietary effect of pomegranate seed oil on immune function and lipid metabolism in mice. Nutrition, 22: 54–59.